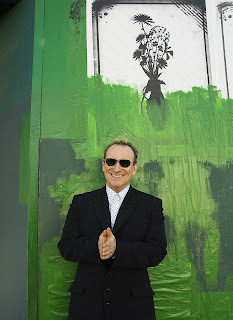 It's appropriate that 80s pop frontman-turned-solo singer-songwriter Colin Hay played local comedy haven the Lakeshore Theater Saturday night. Armed with a healthy supply of both one-liners and heartfelt acoustic tunes, Hay's act was as much a stand-up routine as it was a musical performance. Throughout his lengthy set, which was preceded by the mellow Americana of Kate Lamont and Blueprintmusic, Hay proved that he is much more than merely the man behind a few new wave chart-toppers. He performed introspective, folky songs such as Going Somewhere, Beautiful World and Waiting for My Real Life to Begin - all likely candidates for a completely acoustic show - seamlessly. And instead of ignoring songs that would please casual fans, Hay delivered familiar aged hits such as Down Under, Who Can It Be Now and Overkill in an organic style that made them fit in comfortably with the rest of the set. Hay followed his opening song with about 10 minutes of banter, stating "We might get three or four songs in tonight." In fact, at times watching the performance felt like watching VH1 Storytellers. The audience found out exactly how I Just Don't Think I'll Ever Get Over You wound up on the Garden State soundtrack after Zach Braff became a regular at Hay's shows and asked for approval to include the song. After receiving his first resulting royalties check in the midst of a kitchen renovation, the choice between real granite and fake granite suddenly became much easier, the singer joked. Sting, who also played Chicago Saturday with the Police, was a major source of Hay's humor. "This usually doesn't happen, we usually agree not play a city on the same night," he said. "I think we attract each other's audience." It didn't stop there. "Do you think his mother calls him 'Sting'?," Hay asked after one song, later continuing his amusing fixation by simply muttering "%*!#@*! Sting..."
Hay also had a turn at one of his self-proclaimed musical heroes, Bob Dylan. Before playing What Would Bob Do?, he recalled recently seeing Dylan play a show during most of which he was tucked behind the keyboards, occasionally singing and sounding like a "man from Afghanistan saying a prayer." He proceeded to do an impression of how this would look and sound just in case we needed clarification. Hay gave the performance of a true entertainer who has the chops to tirelessly carry an acoustic, two hour show as the only one on stage and keep the audience entertained throughout. Man at Work, indeed. Yeah! That's what the hell I'm talkin' bout!